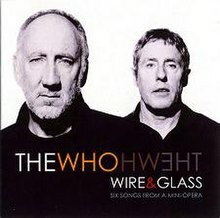 Wire & Glass (subtitled "Six songs from a mini-opera") is the only EP released from the Who's 2006 album, Endless Wire. The EP was released exclusively to the iTunes Music Store on 17 July 2006 but a Maxi-CD/12" was released a week later in Australia and the United Kingdom. The EP was released as a "mini-opera" in six songs. No North American distribution was secured prior to the release of Endless Wire, but promo copies were pressed in France, Germany, Ireland, and Ukraine. The EP reached the top three on the Canadian Singles Chart. The songs from this album were used in the rock musical adaptation of The Boy Who Heard Music which debuted in July 2007 as part of Vassar College's Powerhouse Summer Theater workshop series. V. They Made My Dream Come True – 1:13"
Upon release as a CD/12", all six songs were presented as a single track. "Sound Round" was reportedly written for the 1971 album Who's Next but not recorded. "Mirror Door" was released ahead of the rock opera for radio play in June 2006, but initial reaction was lukewarm due to a questionable mix. Between dates on the 2006 UK and European tour, Pete remixed the track, adding echo to Roger's vocals and giving it a punchier sound. ^ Peter Huntington, the drummer for Pete Townshend's girlfriend, Rachel Fuller, plays drums on the EP due to the absence of regular Who drummer Zak Starkey as he was touring with Oasis. This page was last edited on 24 October 2018, at 05:19 (UTC).